There are only three students at Lumacha Primary School in a remote, mountainous area of northwest China's Gansu province. As the children from better-off families in the community have been sent to more well-equipped schools, the three remaining have come to represent the most underprivileged members of Chinese society. Fortunately, live streaming, the trendiest social activity among Chinese youth, is transforming the classes in Lumacha. With only an internet cable, an overhead projector and a webcam, the three students are now able to take part in online courses. A music teacher appears on the screen, instructing the children on how to read musical notation while correcting their singing. There is also a teaching assistant present in the classroom to manage the students. In Gansu, there are nearly 1,000 schools like Lumacha with less than five students. In order to provide a better education to these children, provincial authorities launched a pilot online education project in 2017. Now, all of the schools in Lumacha's district have adopted the same class schedule and recruited excellent teachers to give online courses. By switching video feeds, online teachers can monitor and interact with students in different schools. Live streaming has connected children in rural areas together. Some outgoing and versatile students have even become "online celebrities." The rapid development of China's internet has brought changes to education in poor areas with underdeveloped infrastructure and few teachers. Broadband construction in rural areas has been accelerating, and new online education companies keep springing up, bringing better public services and technologies to rural schools. The government and its national strategies have both played major roles in pushing it all forward. 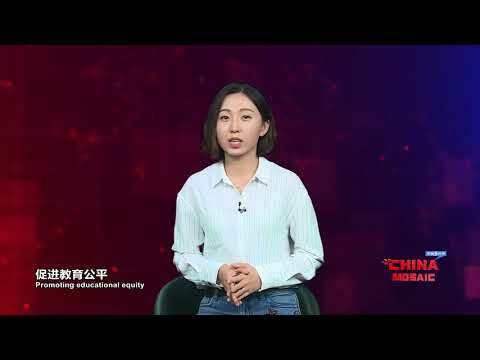 Promoting educational equity is one of the issues that the Communist Party of China and the government pay the most attention to, because it is an important basis for social equity. Nine-year compulsory education was implemented across the entire country by 2014, and now, through live broadcasts online, poor students in Lumacha Primary School can get access to arts curricula that were inaccessible in the past, reflecting an even deeper pursuit of educational equity. China's significant progress in internet technology and artificial intelligence in recent years has attracted global attention. At the same time, a spotlight has been shone into the poorest corners of China. It is evident that the Chinese government is working to develop its economy, while still paying attention to social equality, so that economic growth can be shared by everyone. Some changes may take time, but they are on the way.